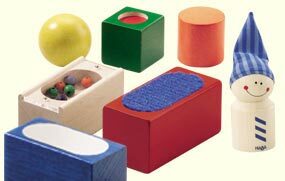 Colored wooden blocks for discovery and construction. Rattling and squeaking with different surfaces and shapes. The 6 blocks and the pixie are an invitation to explore. Made of beech wood. Large block measures 3" x 1.5" x 1.5". Recommended for 1 year and up.